I had absolutely no idea what she was talking about because this was the first I had heard of it, so I asked her for clarification, and she sent me the link so I could see for myself. I refreshed the page a couple of times and rubbed my eyes to make sure I was seeing something that was really there, and indeed I was. 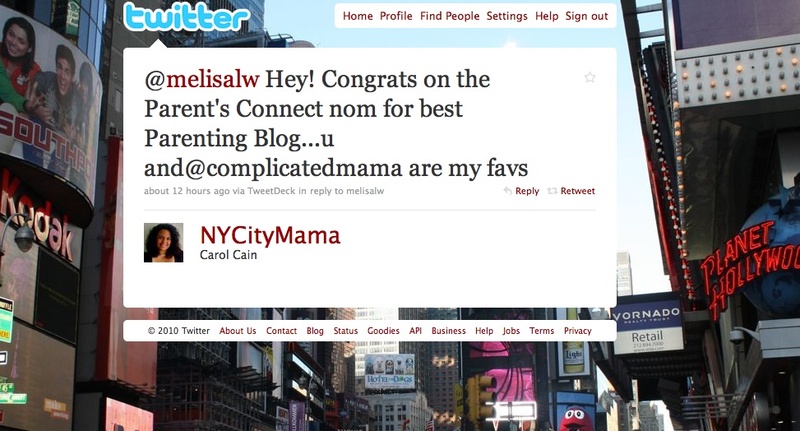 Apparently I have been nominated for a 2010 Nickelodeon Parents Connect “Parents Pick Award” for Best Parenting Blog! I’m not sure who the angel was who did that, but if you’re reading, thanks so much! It’s an honor to be on that list! And now, I need to ask you all a favor. The initial list of 48 blogs will be whittled down, in about one month, to ten blogs that will move on to the voting round, the winner of which will earn the title Parent Pick 2010 Best Parenting Blog. If you register at Parents Connect (for free), you can nominate me (okay, or any of those other ladies and gentlemen…but, ME! You know?) on a daily basis. As I understand it, the ten blogs with the most nominations move on to the next round. So please, do me a solid and go nominate Suburban Scrawl? By the way, yes, of course I noticed that they spelled my name with two S’s. I’m in the process of asking them to fix it. No worries. You can get to the page by clicking here. And don’t look for my header as the graphic; they used that goofy picture of me holding my trusty, dented, pink duct-taped Olympus! Thanks so much for your support! And thanks to Nickelodeon’s Parents Connect for the honor! That's awesome! Good luck… but we already know your the bestest. Sooooo cool! You've got my vote! Congratulations! Of course I went and voted for you! That is wonderful news, Melisa! Backatcha, Melisa! I often wonder if they just pick the names that are on the first pages of the google searches or something. I mean, my blog name pops up pretty easily just because of it's TITLE. Wait! That's not it! We are there because we ROCK. Go Chicago!